TDmonthly - Setting the mood: What music should you play in your store? Setting the mood: What music should you play in your store? CD sales are way down, and you still need something to play in your store - but what? Playing music helps create an atmosphere in your store that reflects your brand, and makes it fun for your customers to shop. Since it's so important, we decided to ask a group of experienced specialty retailers what music they play in their stores, and why. "We play our own science-themed music (Swamp Stomp Boogie) and other non-annoying kid music, such as Laurie Berkner and Steve Songs," Mary Porter Green, owner of Curiosity Zone in Ashburn, Va., told TDmonthly. "Annoying would be KidzBop or Barnie," she clarified. 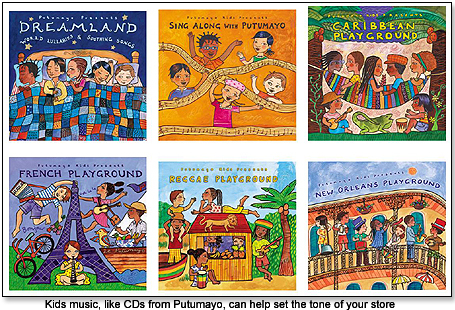 "We play contemporary kids music, like Putumayo," Donna Frederick, owner of The Play House Toy Store in Durham, N.C., shared. "We haven't sold CDs in years, but music that's on the radio is not appropriate," she explained. Gary Green, owner of Toy Box of Asheville in Asheville, N.C., told us that they sell CDs for a couple of local musicians, but that's it. "They sell better when the bands are active in the community," playing shows and at events, he explained. At Kaleidoscope Toys in Round Rock, Texas, they play, "Family-friendly Pandora and Spotify," Owner Terry Myers told us. "It provides positive energy when there's happy kids' music," in the store, she shared. And Dan Marshall, co-owner of Peapods Natural Toys & Baby Care in St. Paul, Minn., shared this piece of advice for those who do sell music: "It's very similar to toys: If the workers like it, they'll sell it better." "Generally, I just kind of play what I like to year," David Stelzer, owner of Shananigans in Baltimore, Md., told us. "Spending so much time in a toy store, I don't want to hear kid's songs too much. I have a little bit of everything from my collection...the Clash and The Ramones. I sell some of the stuff in my store, but not all. I haven't had a negative comment in the almost 10 years I've had the store - only positive. Some of them are in the same boat and don't want to hear the kid stuff anymore," he elaborated. "We play XM Radio, all different genres, and not always kids music. Sometimes we go by decades," Teresa Ford, owner of Kids Ketch in Lewes, Del., told us. "We used to go crazy listening to the same CDs over and over to try to sell them. But we realized that people aren't really buying CDs anymore, so we don't sell them anymore," she told us. "We do not sell children’s music so local radio stations supply the background music for the store," shared Joe Berardoni Jr., owner of Pun's Toys in Bryn Mawr, Pa..
"We don't sell music. Whoever is working picks the music, seasonal if relevant. We play music for our Dancing Water Speakers, which helps," Bryan Raddatz, manager of The Time Machine in Manchester, Conn., told us. What music do you play in your store? Share with us on Twitter or Facebook. •Setting the mood: What music should you play in your store?